After soaking up Madrid's beautiful parks, well-groomed boulevards, and rich repositories of world-class art, you may be ready for a change of pace during your vacation to Spain. 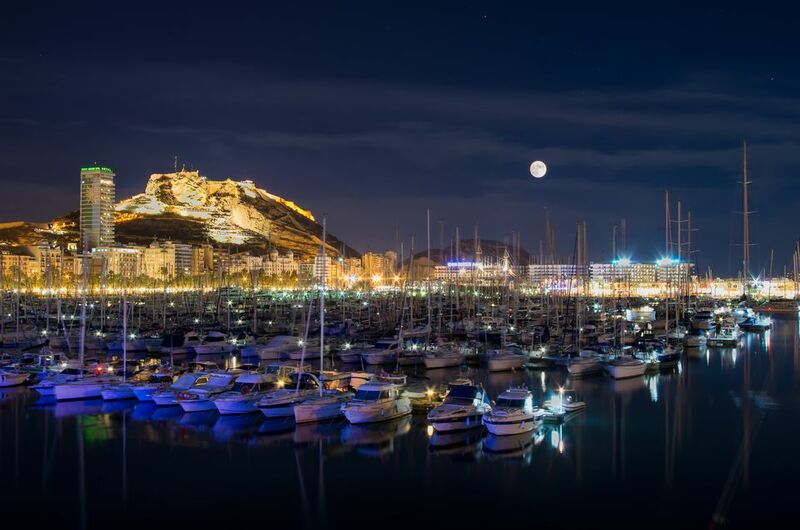 Head to Alicante, an old port city on Spain’s southeastern Costa Blanca, to uncover narrow streets, colorful houses, stunning views of the Mediterranean, and a fantastic nightlife scene. Traveling between the two cities is quite simple. You can transit between the two in several ways, ranging from a high-speed train to an inexpensive bus. Read on for more information about how to travel between Madrid and Alicante. What's the Best Way to Get from Madrid to Alicante? The train is by far the quickest option, and it's often not too expensive either. The high-speed train travels at impressive speeds of more than 200 miles per hour, making the journey exceptionally quickly. The train stops in Cuenca along the way, which is a great place to break up your travels. As mentioned, the high-speed AVE train runs from Madrid to Alicante. The journey takes between 2 hours, 20 minutes, and 2 hours, 40 minutes, and usually costs between 25 euros to 65 euros, depending on the time of day, how far in advance you book, and the class of service that you choose. You can book train tickets in Spain direct from Rail Europe, or you can book through an aggregator service such as Trainline. The bus from Madrid to Alicante is another option. This trip is much lengthier, and some would argue less-relaxing than taking the train. While less expensive (tickets can cost as little as 13 Euros), the trip takes around five hours—sometimes as much as six-and-a-half hours. You can book from ALSA, or through another ticket aggregator like BusBud. Driving from Madrid to Alicante takes a little under four hours, on the A-3 and A-31 roads. There are tolls on parts of this route. For inexperienced drivers, driving in Spain can be risky—it's recommended that you're well-versed in the rules of the Spanish road. Make sure that you are carrying your driver's license, insurance documents, and other required items at all times when driving in Spain. Also, there are very few actual "expressways" in Spain, which can add time to your journey. Most roads in Spain are "N" roads, which can vary in quality, ranging from broad, multi-lane roads resembling highways, to winding country roads with traffic lights and driveways. Flying from Madrid to Alicante (and vice-versa) is an option. The flight time is just about an hour, but when you factor in transportation to and from the airport and security checks, this can be a much more time-consuming option than the train. Iberia and Air Europa serve the route with non-stop flights. Round-trip fares on the latter typically run around $160, as of February 2019. What's the Best Way to Get from Madrid to San Sebastian?